Shabby chic furniture is linear and simple; therefore, we must avoid over-decorating said furniture. We will show you modern furniture for every part of your home, from the kitchen to the bathroom. Although the modern furniture is the same style, here we have for all tastes, of all colors and sizes. 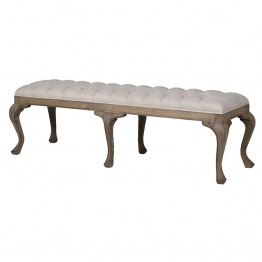 The most amazing thing in a home is which strikes at once; happily the French bench style that La Maison Chic encompasses is best. We offer the best quality and take care of your home belongings as ours. An exclusive design for your study or workplace, Albine Fawn Velvet Bench modernity has the same comfort as other styles, if not more. Get this fawn velvet textured bench from La Maison Chic and look how cool it appears to be. Buy Antique Barbefleu Bench Stool design at the best price. It is inspired by the famous turner stool. In our online store, we have stools 100% quality, cheaper, cheaper than in any other store. Blanca Distressed White Bench looks amazing in white color. This has a black backrest, white sheepskin and black and white cushion. Everything is from La Maison Chic which simply looks trendy! The Buttoned Linen Ottoman along with the best and fines making help you to separate the different environments of the terrace, lounge, rooms, or drawing rooms. The good thing is that they share a decorative style and are perfectly integrated. If you have space, assemble it completely and you will not leave it. The ceramic Decorative Drum Stool and the Workbenches with smooth cushions work wonder. This stool is the ceramic-based along with the finest art done on it. The buttoned Linen Ottoman gives warmth while decorating giving a very natural touch to the spaces. Coffee table and sofas when accompanied with these ottomans make it the most striking place in the house. Ceramic Drum Stool is one of our favorite outdoor corners things and it seems that you too will like it! It is drum-shaped and made of ceramic. Do you want to see the rest? You have them all here. Keep reading and but things at La Maison Chic. The latest trends in decoration bring benches of infinite shapes, models, colors, heights ... The Fabienne Linen Distressed Bench design prostrates at the foot of this unique seat, which may well be backed or lacking. Such a variety of Ottoman of contemporary design makes it a seat adaptable to any type of style from the most industrial and minimal style, to other more romantic or classic-renewed, as in the case of the Mid Century Modern MOOD. Practicality is one of the premises that govern the decoration with stools. By just occupying space, they are perfect for houses or apartments MINI, because, in addition, they are easy to store. There is ivory in color that makes them look classier. Its exceptional design and utility to access what you are looking for, make this piece essential to carry out the interior design of your house. This is a buttoned benched where ever kept looks mind-blowing. 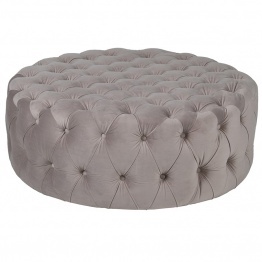 This is a grey colored ottoman that is mainly loved by the hotel industry. This grey striking ottoman is famous for its essence, practicality, and functionality. However, it is also loved in houses. It has a large storage capacity. It will help you to organize and order pillows, blankets, books, clothes, bedding, toys, and shoes and much more, to be able to have your home more organized. Made with high-quality materials and durable and constructed in premium with resistant fabric, special for durability, the color that does not it gets dirty easily. So buy it now! This one reflects its name, it is studded and it is kitchen equipment or a lounge table is the ideal place to place several stools, and can then be stored in a closet or under the table. All these styles (and in a wide palette of tones), are waiting for you in the online SHOP. It is a versatile piece for any decoration plus a seating. Marche Button Bench is a part of the traditional furniture for centuries. They can be used as a compliment both inside and outside space. If the terrace does not convince you, you can settle on this Bench. It comes with simple and comfortable outdoor fabric. The buttons that are studded make it appear more stylish. It gives color and grows so much so that; you can multiply your comfort levels. The stool is extra durables since is made up of metal. Nevertheless, it is most comfortable while you sit on it. It can be placed n stores, kitchen, outdoors, on indoors. Stools There are many, but with those who never make mistakes are with the classic style. It is a certain romantic and rural air and a good support. These are the most traditional stools which you can keep for your foot or even for sitting. This footstool is of rose gold color which the best is of the best if we talk about the La Maison Chic French stool. It will suit you both in a rustic style kitchen and in a more modern style. Of course, in the latter you will have to play with the color of wood and if it is used. They allow enjoying the outside or even inside. You do not deprive yourself of the views or the feeling of being outdoors, but you forget the cold! Plus the added benefit is that it is made of fur so is soft- comfortable and you can place your stuff inside it too. In La Maison Chic you will find furniture for that you have always wanted: it is at least three times more durable than other furniture, it is manufactured by experts and we have styles and finishes of shabby chic furniture. Buy now as we are the best both in quality and in rates.